Trying hard at something, and usually there’s some kind of risk involved; going all out. Example: Wilma owns a restaurant that has been doing just fine over the years. However, recently her customers have started to dwindle, and as a result, she’s been losing money fast. If things continue like this, she’ll have to close up shop for good. In a last ditch effort to get customers to return, she’s decided to completely overhaul the menu. Wilma is going for broke with this decision, but she hopes it will work out for the best. Dice are used in the game craps, which is where this expression is believed to come from. The origin of this expression is believed to be from a dice game called “craps.” According to Wiktionary, this phrase is actually slang from Hawaiian Pidgin craps. 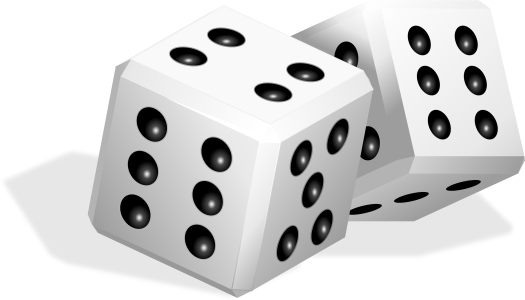 This game is often played at casinos, and the participating players can wager everything on a single roll of the dice. That would be a risky thing to do, however, as the decision would either work out for them, or if they get a bad roll, then it would leave them completely broke, that is, they would have no more money or chips left. “…decided to do things properly, and their favorite contractor was told to go for broke, as the saying is, and to do the place over from caves to basement. Jacob had trouble using a keyboard, but he wanted to improve his typing accuracy and speed so he decided to practice hard. He’s going for broke. There’s only a few minutes left in this basketball game and it’s a close one. The losing team is going for broke by playing a more offensive style. Note: This website has the meanings for many phrases, sayings, and idioms, and their origins too! But did you know that the origins for certain expressions are not clear? It’s true, and in cases like this, what you’ll usually see instead on the page is an explanation as for how an expression may have come to be.